We are delighted to host again one of our favorite speakers and long time supporter of the Palomar Orchid Society, Fred Clarke of Sunset Valley Orchids. Fred will be presenting one of his newest talks on “Spotted and Splashed Cattleyas”. As many of you know, Fred is excellent orchid hybridizer and has pioneered the development of new lines of compact and mini cattleyas. Fred’s presentation will highlight his hybridization efforts with this versatile class of orchids. Fred is a highly sought after lecturer on many orchid subjects and travels extensively around the United States, Canada, Australia, New Zealand, South Africa, Latin and South America. We are fortunate that he agreed to kick off our first talk in the Lake San Marcos facility, which should prove to be one of the highlights of our 2013 speaker’s program. Fred has been growing orchids for 34 years and has been hybridizing for 26 of those years. With over 26 years as a professional grower and manager in the horticultural industry, Fred applies these skills at his orchid nursery, Sunset Valley Orchids, located in Vista, California, just north of San Diego. His nursery’s website has considerable information, plants for sale and many beautiful pics of his award winning orchids. Fred is a passionate orchid grower whose curiosity in orchids is broad and varied. Although developing new Cattleya hybrids has been a primary interest, he is also actively creating new Bulbophyllum, Paphiopedilum and Aussie Dendrobium hybrids. Moreover, his pioneering work in Catasetum intergeneric hybrids led to the development of several notable hybrids, most recently the grex, Fredclarkeara After Dark, which produced “the closest flower color to black ever witnessed”. This grex received seven FCC’s and three AM’s on the first flowers shown for judging. 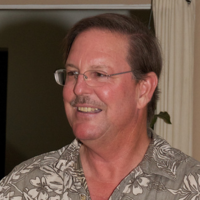 Fred is an accredited judge in the Pacific South Region and an AOS trustee. His plants have received hundreds of quality awards from the American Orchid Society. Some of you may not know it, but Fred is also the manager of the Flower Fields in Carlsbad.